At Infinity Web Services, honesty and integrity are 2 very important qualities we live by. 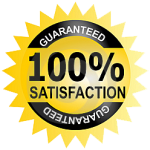 So we’ve created a list of guarantees that are included with every plan and service we provide. Our goal is to provide you with 100% satisfaction. We will accept nothing else! If you’re not completely satisfied with something, let us know so that we can do everything we can to fix our service so that it meets your needs. We’re so confident you’ll be happy with our service, we are happy to offer a 45 day, money back guarantee. We’re so confident that you’ll enjoy our web hosting service that we promise to refund you your monthly payment (except domain and SSL fees, please refer to our terms) if you are not satisfied with our service. There is literally ZERO risk to trying us out (note: you own the domain and can take it with you wherever you go). Our support technicians work round the clock! Regardless of your country’s timezone, we’ll answer your tickets in a fast and courteous way. We guarantee that we will never, ever increase our pricing on your hosting plan. The second you sign up you are locked in at the price. Regardless if the market changes, as long as you remain an active customer of Infinity Web Services, YOUR cost will NEVER go up.